I find it odd that only four GMs are in the MLB Hall of Fame since they impact the game in so many layers. It also seems off base that it only costs a measly $2 million a year in salary to Brain Cashman for the Yankees to have the highest paid G.M. in baseball. Without a doubt, the playing field general managers play on is far from even since there is no MLB salary cap. A G.M. in 2014 needs to understand the economics of baseball beyond Econ 101. As a result, there were more GMs in 1989 (23%) that had extensive non-baseball business experience than in 1999 (7%) and 2009 (3%). The data says the average age of GMs has decreased over the past 20 years giving way to a new generation of sport technology savvy executives who will undoubtedly be paid accordingly in the near future because of the ROI they bring to an organization. Almost all GMs have performed in scouting and talent evaluation positions at one point in their careers (81% in 1989, 87% in 1999, 90% in 2007). Grinding out a career in the minors is how 50% of 1989 GMs began their careers, but that number has decreased significantly to 3% in 1999 and 10% in 2009. Having an actual MBA or the equivalent in business experience is the new must have for GMs. It seems like the Seattle Mariners had a pipeline to the Yankees going until Robinson Cano signed with the M’s in the off-season in the kind of signing that can transform a struggling franchise and win the executive of the year award, or else lead to the ouster of the executives who spent a quarter of a billion dollars on one player. Trades are good for baseball expect when one team fleeces the other. On Jan. 5, 1920, the Red Sox sold Babe Ruth, to the Yankees for $125,000, plus a $300,000 loan. It took the hiring of a young gun G.M. name Theo Epstein by Boston ownership to finally overcome the curse of the Big Bambino. Epstein is now in Chicago trying to pull off the same kind of franchise magic for the Cubs. The league was probably not as good back then but the all-time team is the Chicago Cubs of 1906 who had an amazing winning percentage of .763. Frank Chance was both their G.M. and first baseman. There is a noticeable trend that Major League playing experience requirements for GMs has decreased over the past 20 years from 27% to 10%. Over the last 25 years, GMs with a college degree has grown to 80%. In both 1989 and 1999, only one GM had his degree from an Ivy League institution, whereas in 2009, four GMs had Ivy League degrees. By 2019, the figure might be double digits. First-time general managers have been hired at a younger and younger age since 1989 (46.3, 41.1, 39.7), and the number of GMs over 60 and under 40 have gone from six and one in 1989, respectively, to zero and five in 2009. The data indicates that the energy is takes to handle so many G.M. responsibilities and moving pieces favors youth. 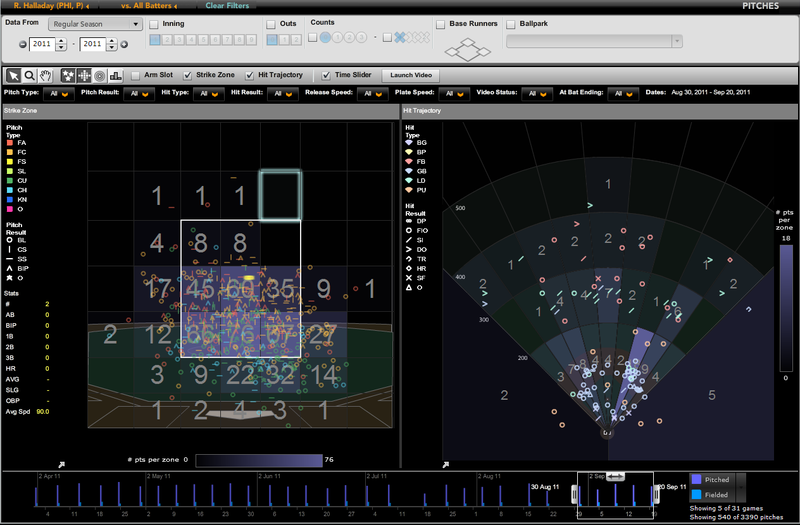 GMs use sports technology by companies such as Bloomberg Sports to track every player in the Major League, as well as the majority of the Minor Leaguers for call up, trades and free agent signings. GMs must monitor the production and development of their Minor League teams and players if they are to have a successful farm system and use sports tech centric platforms, apps and tools to manage data. The new breed of MLB General Manger has the ability to work within the system or else figure out a way to work around smaller payrolls and limited resources with data driven decision making. Having all the cash is not a sure fire way to win the World Series however over time it is hard up to keep up with the largest spenders. • Doing More with Less Money. Moneyball is born. GM Billy Beane, Oakland As. Has made playoffs with among the lowest payroll in the game. • Doing More with More Money. NY Yankees, Atlanta Braves, Los Angeles Dodgers. • Winning with Superstars: San Francisco Giants. The GMs listed below are winning in what I call, the Sports Techie way. • Andrew Freedman: Tampa Bay. No money, bad stadium, still wins. • Billy Beane: Oakland A’s. Revolutionized the game. • John Mozeliak, St. Louis: Traded Albert Pujols and guess what? Team got better and won the World Series. • Jon Daniels, Texas Rangers. Trading guru. • Brian Sabean, S.F. Giants. Proves pitching wins. Won 2 World Series in past 4 years. The 3 Best General Managers of All Time has some Seattle history with Mr. Pat Gillick. Under Pat, I was able to give demonstrations of various sports technology systems and products to the Mariners such as Dartfish, including during the 2001 season that is considered to be fourth in the Greatest Teams of all time (based on winning percentage). It is incredible that Pat Gillick turned four teams into significant winners : Toronto Blue Jays, Baltimore Orioles, Seattle Mariners and Philadelphia Phillies. I just watched the movie 42 on HBO again with our nine-month old son who loved watching Jackie Robinson on the base paths. Branch Rickey is a top all-time G.M. because he signed Robinson to a major league contract breaking the color barrier. Edward Barrow winning 14 World Championships as the General Manger of the NY Yankees between 1920 and 1939 when World War II was beginning is legendary. 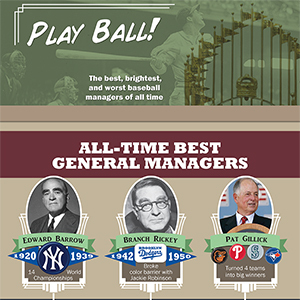 Our gratitude goes to Sports Management Degrees and Sophia for the timely Infographic. Sports Techie, Going from worst to first like the Boston Red Sox did is an incredible feat. As a result, contract management skills are immensely important for their current baseball executives to maintain short and long term successes. Blundering this has cost many a G.M. his job over the course of MLB history. Terrible trades happen, but none has changed the fortune of a franchise like those by M. Donald Grant, New York Mets (1277-1550, .452, 17 seasons) who traded both Tom Seaver and Nolan Ryan, devastating the expansion franchise that was poised to be good for a long time with the two hall of fame arms in their rotation. Scouting and player development are seamless today. Teams like the Seattle Mariners are opening new state of the art academies in baseball hot spots countries in Central America, South America and Asia, trying to uncover the next superstar. The MLB draft is so completely data driven that high school and college top round picks have a good idea as to what number pick and to which team they might be drafted to, resulting in the possibility of a hold out rather than risk getting drafted by a league doormat. With the rapid integration of Ivy League educate general managers, my educated guess tells me their interview skills have to be a real difference maker when landing these coveted positions. Having the Ivy League polish to convince a major league owner you have the moxie to spends million of his dollars in an attempt to win a World Series with the resources available has to be a compelling pitch worthy of influencing any Fortune 500 company CEO. I am super excited about the upcoming 2014 MLB season, spring training and fantasy baseball, let’s play two.